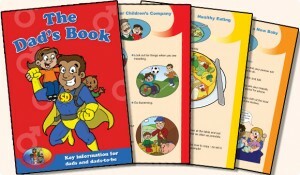 The Dad’s Book is the tenth title in the highly successful Caring for Kids parenting series from Kid Premiership. It has been designed especially to meet government policy on engaging with dads and encouraging them to become more involved. The use of bright cartoon images and simple text ensures that the key messages are delivered in a style that is easy to access for all dads and dads-to-be. The Dad’s Book has been developed in association with BD5 Dads, Burnett Fields Children and Family Centre, Canterbury Nursery School Centre for Families and Children, Woodroyd Children’s Centre Plus, West Bowling Youth Initiative and Bradford District Council Bradford District Council text. Log on to www.kidpremiershop.com to buy online or if you are purchasing on behalf of a local authority organisation call David Harban or Caroline Lee on 01484 668008 and an invoice can be sent out with your order.